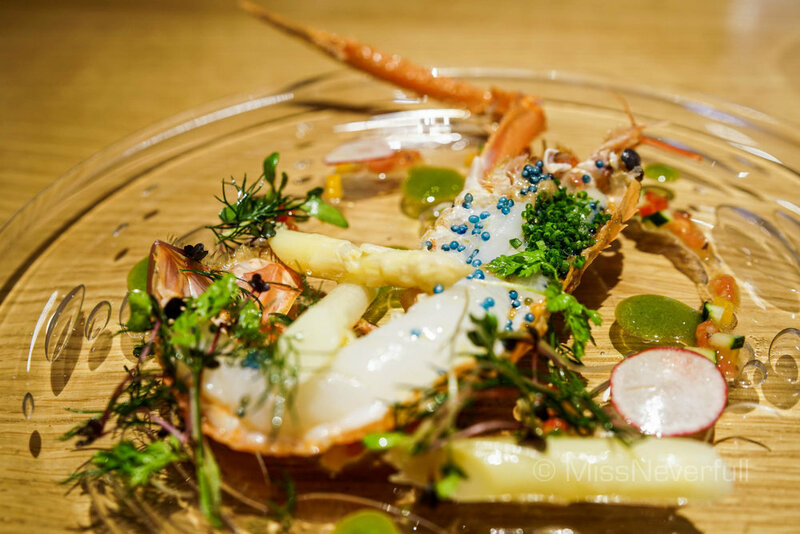 Terra is a very first Tokyo-Italian fine dining concept in Singapore. Opened by the Chef-Owner Seita Nakahara in Oct.2015, Terra has already eyed by Singapore's first Michelin Guide within a year since its opening. The Chef-Owner Seita Nakahara have been cooking Italian food for almost 20 years. He was trained at few traditional Italian restaurants in Tokyo before enhancing his culinary skills in Tuscany, Sicily and Piedmont in Italy. In 2010, Seita-san returned to Singapore and worked as Executive Chef in Enoteca L’Operetta. With Seita-san's Japanese base, Seita-san aim to offer authentic Italian good with a seasonal twist of Japan. All serving fine dining Japanese-Italian food, he interior of Terra is quite casual that won't make you feel restrict at all. Terra offers around 12 tables seating a total of 50 guests at a time, featuring a 6-seat counter as well. From the semi-open kitchen, you can see the chef preparing food with a passion. I was eating there alone that day and the service was impeccable, the managers came to my table from times to times to ask me how do i like the dishes and we had a lovely time sharing thoughts on fine dining. Similar to Japanese Kaiseki, Terra offers Omakase menu which means the chef decides what to serve for the day depends on the daily ingredients. Besides $128 and $168 up to $208 for the Omakase menu, Degustation menu priced at $98 for 6 dishes is also served along s side a 3-course and 4-course lunch menu at $42 and $58 respectively. Seita's signature homemade pasta is included in all the sets. Before starting the meal, i was displayed all the best ingredients of the day: lobster, scampi, black truffle, scallops and clams, white asparagus, tomato and Sudachi - all freshly sourced from Japan. 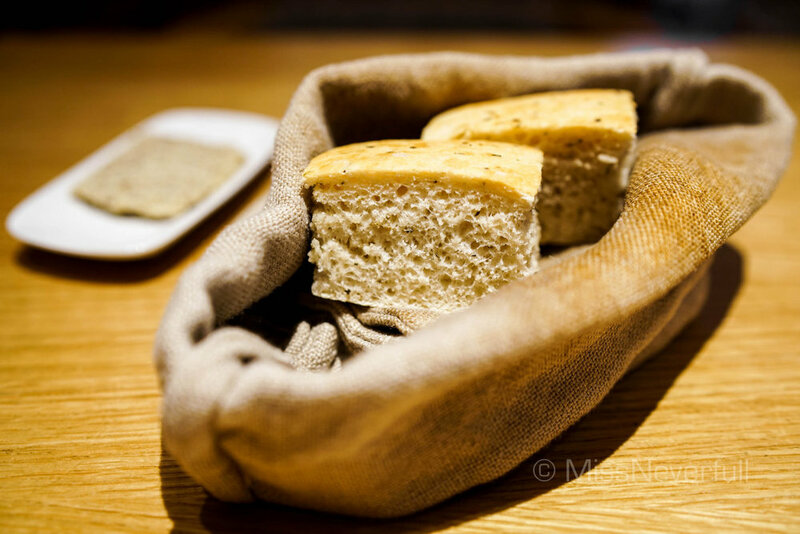 Followed by a warm 'bag' of homemade focaccia, side by aromatic homemade porcini butter with a depth of mushroom flavours, so delicious with the soft and airy breads. The first 'dish' of the Omakase menu is the sea urchin bruschetta, featuring fresh Hokkaido uni on top of the a toasted bread. The creamy sea urchin works well with the crispy bread, its fresh and umami flavor was incredible, with a pinch of baby scallions to lift its aroma and sweet hint. Next arrives a rarely-touched scampi from Shizuoka, Japan, garnished by white asparagus, lobster caviar, tomato puree, radish and herbs. It was a light the refreshing combination, i liked the sashimi-texture scampi meat but the scampi itself smells a little bit fishy. And chef again uses scallions in the dish, duplicate ingredients is not a good sign for most of the time (just my personal view). The oven-baked scallop came with a lovely cheese and garlic gratin aroma. Pairing with four kinds of mushrooms, the scallop was quite large in size and makes me mouth watering. Despite its umami and deep flavours, its texture was a disappointment as I expected it to have a soft and juicy center but it was overcooked. The main reason i came to Terra is Chef Seita's homemade pasta. The first pasta dish was the signature uni pasta with homemade Karasumi (dried mullet roe). The spaghetti was perfectly cooked al dante, sea urchin was fresh and umami, with Karasumi to wonderfully enhance the oceanic flavours. Chef Seita served the snow crab spaghetti instead of mushroom risotto, two ingredients here were same as the uni pasta, thus the entire dish didn't surprised me that much. The snow crab was of course, juicy and delicious. Dessert was mostly consists of fruits, topped with jelly and sorbet. It was pretty redressing. I liked the casual and relax ambiance, and most of the dishes was flawless but i wish Chef Seita can serve a more verity of ingredients in Omakase menu. On the other side, nothing really surprised me besides the impeccable hospitality. The totally bill comes around $200 SGD - to me it is not that cheap regarding to the value. In terms of Italian food in Singapore, i think the concept is quite good and the food was delicious, while the dishes lack some surprises.